Veganism — has it ever been more accessible and accepted as a lifestyle, rather than a fad diet, than it is today? In the last three years alone, there's been a 600% increase in people identifying as vegans in the U.S — but there are still so many many myths and misconceptions about the vegan diet. For example: Vegans don't get enough protein, or the vegan diet is unsustainable, or vegans are just hungry and bored all the time. Which might be the case for some vegans (as it might be for advocates of any diet! ), but that certainly doesn't have to be the case. 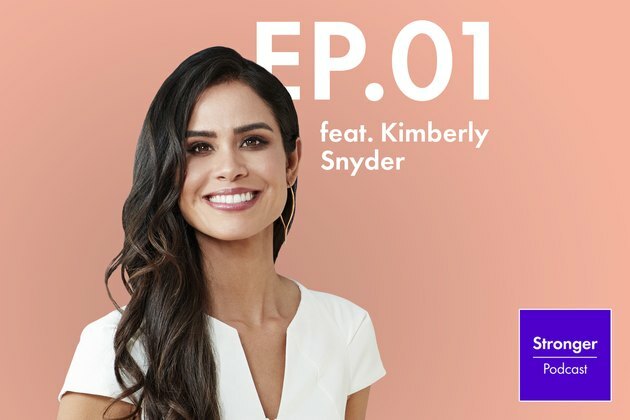 Just ask Kimberly Snyder, long-time vegan, nutritionist, and New York Times best-selling author of the Beauty Detox series, who joins LIVESTRONG.COM on this week’s episode of the Stronger podcast. A leader in the plant-based diet community, Snyder helps us break down some of those misconceptions surrounding the vegan lifestyle, and provides a refreshingly balanced and realistic view on how veganism affects our health, and the environment. She also highlights how there is a right way and a wrong way to be vegan — just because you follow a vegan diet does not necessarily mean you are being healthy. Listen to Your Brain As a Vegan to hear what Snyder has to say — and visit Thrive Market for all your organic food needs! You can also read some of the highlights from our interview with Snyder about what happens to our brains when you eat vegan, below. How Does the Vegan Diet Help with Brain Health? With our brain, and with our bodies in general, we know that inflammation degrades our whole system. It keeps our organs from functioning as well and can really inhibit focus, memory, happiness and our moods. There are many levels of how being a vegan can help the brain. We know that the gut, for instance, is connected to the gut-brain axis and now the gut-brain-skin axis. When we are eating nourishing whole foods, like fiber, it helps to feed the lining in the gut and the short chain fatty acids, and it helps to create a healthy microflora balance in our guts. We also know when you shift to eating more plant-based, you’re reducing the charred, processed meat from you diet, which can possibly contain carcinogenic compounds, chemicals, steroids, hormones and things that can be inflammatory to your brain. For a lot of people, there’s just a lot of issues with digesting certain animal products. Dairy can also be difficult to digest, so anything that’s creating havoc in your digestive system can have a connection to your brain. 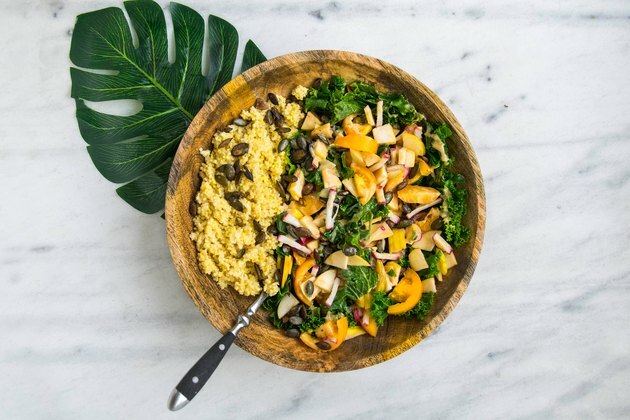 What Is the Difference Between a General Vegan Diet and a Whole-Foods Vegan Diet? Sure you can be a starch-aholic and just eat white pasta all day or Oreos and technically you're vegan. And maybe that's better for the environment, but you can go way beyond that and choose whole foods. To me, by being plant-based (I always use that term over vegan), we’re choosing the most nourishing foods on the planet. These whole foods have this incredible synthesis within them, all these cofactors, all the ways that the nutrients work together synergistically that science hasn’t figured out. So when we eat whole foods, we’re connecting with nature. We’re connecting with the whole. And I believe the definition of wellness is being in our wholeness: Spiritually, emotionally, mentally and physically healthy. We’re whole beings, and whole foods support that. Processed foods are always going to be fragmented with parts taken out, and artificial things added. So they might be shiny, and colorful, and pretty, but they lack that power. When we eat whole foods, again our wellness and our power is in our wholeness, we’re helping to restore that. We’re putting in all these antioxidants, phytonutrients, fiber (fiber is only in plant foods), vitamins — everything that comes from the earth. Again, it doesn’t have to be all plant-based if you’re not there yet, but the more we choose whole foods, the better we are. How Would You Transition Someone From an Omnivore Diet To a Vegan Diet? I would say start in the morning (it’s not necessarily just the eggs or the bacon). If you are a coffee drinker and you use milk, switch to coconut milk creamer or almond milk. Thankfully, even large chains like Starbucks have almond milk, organic soy milk and coconut milk. So start by cutting out animal-based products in the morning. And if you do like yogurt, as I do, there are so many amazing coconut yogurts out there. Even my two-year-old son loves them. So really, just start in the morning when you have control over what you’re eating and your schedule, and then start to build from there. For lunch, instead of always putting grilled chicken on your salad, maybe some days you have lentil soup and a salad. Or you eat a brown rice avocado sushi roll. Or you put a bunch of quinoa at the salad bar on your salad. Start making swaps at lunch. Dinner, for a lot of us, is when we are with our families. So many moms say to me ‘I don’t know what else to cook for my family, my husband always wants meat.' Or 'I’m out at a restaurant.' Or 'This is social time.’ So we would tackle that later. With clients, I’m always saying 'Morning time, lunch time, snack time. Let’s start there.' And then you have that experiential feeling of lightness, of feeling in tune with your body, of feeling amazing. Maybe your skin starts to look brighter and better. And your eyes become brighter; your focus is there. And then eventually, maybe, we go into dinner. To learn more about what happens to your brain when you eat vegan, listen to the whole podcast here.